Hello everyone, this is Pisaac. 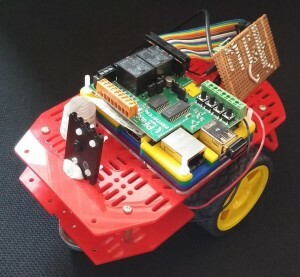 Pisaac is built from a Raspberry Pi, a PiFace, a DRV8833 motor controller on a breakout board, a Dagu “Magician” robot chassis which I got from Amazon (also available from many other retailers! ), an Edimax Wifi dongle, a mobile backup battery pack and a Raspberry Pi Camera module. Why am I building Pisaac? Just for my own entertainment really! So far, Pisaac’s most effective use is scaring the dog. He can be controlled using an app I’ve developed for the mobile phone. That’s Pisaac, by the way, not the dog! As you can see, my construction techniques so far could most generously be described as “a little rough” – that’s because I’m really a software person, so I’m concentrating on getting the software working. If I can be bothered at some point in the future, I’ll dispense with the blu-tack and replace it with something more permanent! The focus on software development so far has been on ensuring that Pisaac doesn’t need to be connected to keyboards, mice, screens or external power supplies beyond initial set-up. He should be, as far as possible, self-contained – for example, as I will detail in a future post, he knows about 3 wireless networks, and these can be chosen using switches on the PiFace. Also, the PiFace advertises Pisaac’s IP address (in binary on the LEDs) once a connection is made. My first priority is to get the camera feed working reliably to a mobile phone app, so I can effectively use Pisaac as a “drone” – i.e. control his movements while seeing the world from his point of view. In subsequent posts I’ll provide more detail about construction (such as it is!) and about how I’ve approached the software and hardware design so far.